Last October, Google signed a $125 million settlement with the Author’s Guild to pay authors for copyrighted works it has scanned and made available on the Web through its Google Book Search project. 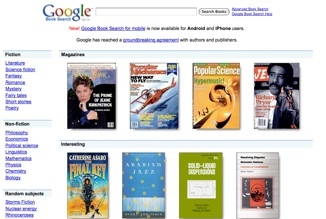 More than 7 million books have been scanned by Google so far, a large portion of them out of print. Today, the Google Book Settlement site went up, which allows authors and other copyright holders of out-of-print books the ability to submit claims to participate in the settlement. What do they get? Authors, publishers, and other copyright holders will get a one-time payment of $60 per scanned book (or $5 to $15 for partial works). In return, Google will be able to index the books and display snippets in search results, as well as up to 20% of each book in preview mode. Google will also be able to show ads on these pages and make available for sale digital versions of each book. Authors and copyright holders will receive 63 percent of all advertising and e-commerce revenues associated with their works. With Google Book Search now available on mobile phones, downloaded e-books could become an interesting digital side-business for Google. (But please Google, convert the scanned text into something more easily legible on the screen). Remember, this settlement is only for the millions of out-of-print books that are making zero revenues for authors and publishers today. So it is not a bad deal all around. Copyright holders have until January 5, 2010 to make a claim.